Hello everyone! I have a dreadful sore throat and feel like death warmed up! I am going to bed and hopefully I will feel better tomorrow and I will write again! I have listed some Felted Tweed in Rage and Cocoa in my store, also some Felted Tweed Pickle at a special price. It is very foggy here but we are going to the Three Horseshoes for dinner – it is only two miles away and so we should be OK.
Rusty brought a mouse in last night and it went under a rug. John tried to rescue it but it escaped. This morning I noticed Rusty crouching beside a box that was in the hall. I peeped down the side and the mouse was there. John was out and Rusty sat on guard until he came home and he rescued it and put it in the garden. I certainly do not want a mouse loose in the house! Now I am going to wash my hair and get Slip’s dinner – lamb chops! Back tomorrow! Laines du Nord Royal Cashmere - Special Offer! I have obtained some Laines du Nord Royal Cashmere at a special price! It is 100% pure cashmere and is a chunky weight. I have 5 shades in my shop and I also have another shade coming – a chocolate brown. If a shade has sold out and you want some, please email me as I do have more coming and can reserve it for you. Wet again today, everywhere is very muddy underfoot and Slip makes such a mess! She is too big to scoop up in a towel and fights being dried – biting the towel! Nothing special is happening this weekend – I don’t know if we are going out to eat or not. Now I am going to unpack some Kidsilk Haze that has just arrived. Back tomorrow! Today has not been good! I downloaded an update from Apple for my iphone and then found the phone had frozen and I could do nothing. After an hour on the landline phone speaking to Apple support, we got it to work again. I had to uninstall and re-install all the software such as iTunes, Quicktime and so on. The support man ( Neil) was very helpful and actually based in the UK – I could understand him!! A box arrived from Debbie Bliss but I have not had time to open it yet -I have hidden it amidst other boxes and shall retrieve it when John is out!! Apart from that, nothing to report! I hope all of you that are in the USA are having a super Thanksgiving! Back tomorrow. Today I had a round up of my odd balls of Rowan 4 Ply Soft and have made them into mixed lots of colors that go together! Next I shall wage war on the Kid Classic. The Ilga Leja patterns came today – four new ones plus some old ones that I was out of stock of. 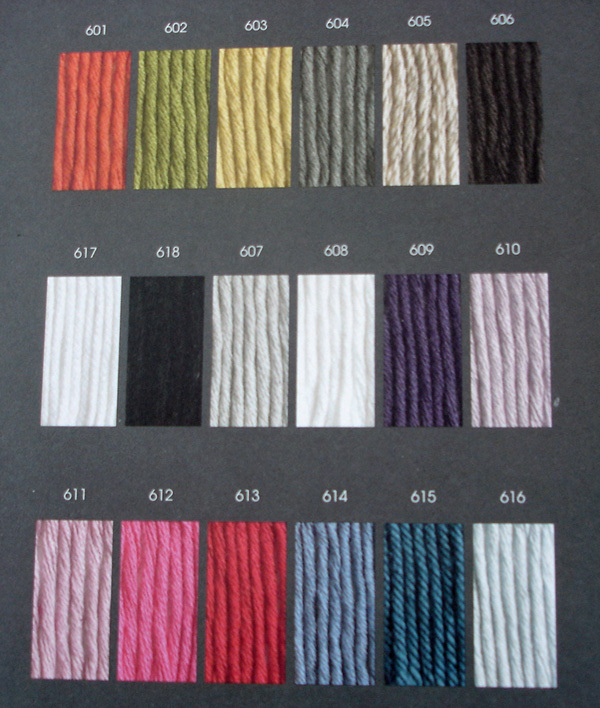 Ilga’s patterns are so beautiful, I wish I had the time to knit them! A set back with my Veronica cardigan. I had placed the pocket lining and was gaily knitting up the left front when it hit me! I was using the wrong size needles – I have had to undo it all and will start it again tonight. The back is on the right size needles – thank goodness!! It has been cold here again and I could scratch my fingers to pieces. I have discovered a piece of starched net curtain is very good to scratch with! The chilblains hurt when my hands are cold, and once my hands are warm, the itching begins. I had to get up in the night and put them under the cold tap to cool them down. Now I am going to cast my left front on again……..back tomorrow! These picture are of a new Debbie Bliss range for Spring 2009. 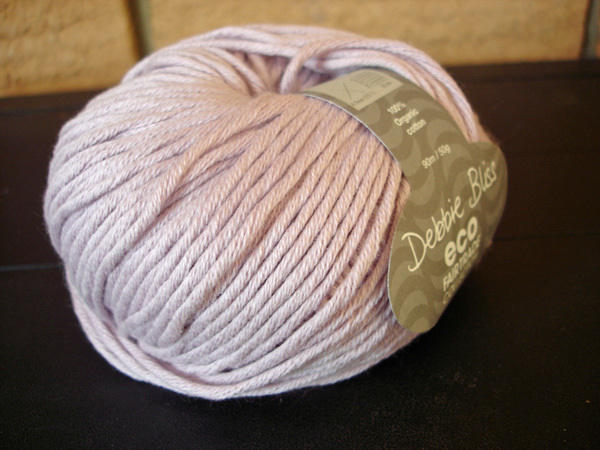 The range is called Eco Fairtrade and this the cotton DK weight. It is organically produced with no pesticides or chemical fertilizers and it is harvested by hand. The yarn is dyed with non toxic dyes and the water used is recycled and rendered drinkable bu a non profit making organisation. The colors are all quite muted and it has a slightly silky feel. We have had snow on and off here, not enough to settle but it is very cold and my chilblains are not happy! I am expecting Ilga Leja’s new patterns this week and also some cashmere which I shall be able to offer at a good price. It is chunky weight and ideal for warm sweaters. I am getting six shades! Now I am going to take a pheasant off the bone for Slip’s dinner! Back tomorrow.